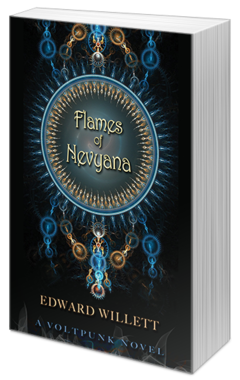 I got a print copy of the Flames of Nevyana from the publisher. When I got it I showed it to my teen and she wanted to read it next because she was impressed by how cool it looks. Aside from the great cover art, the paper is really smooth and white and she loved that it has a map. The story takes place in Nevyana, which seems like a fantasy setting. There are three main groups of people who co-exist in an uneasy cold war - the Citydwellers, the Freefolk, and the furred and nocturnal Nightdwellers. The main characters are three teens from each - Citydweller boy Petra, Freefolk girl Amlinn, and Nightdweller boy Jin. They are all exemplary young citizens, but the theft of important magical items from their respective peoples throw them together in a quest. Very traditional fantasy set-up, right? But there's a twist! We start getting hints that what seems magical may actually be technology, and the characters themselves are faced with a huge paradigm shift as everything they've grown up believing comes into question. I liked the characters - I like that they were idealistic, and wanted to do the right thing, and not angsty (sorry, I'm just tired of angsty teen characters lately). So I found that refreshing. I loved the fantasy to sf twist. Great world-building, a fantasy feel with an SF twist, admirable characters, and the themes of courage and truth above all make Flames of Nevyana a wonderful YA read. I know my teen will really enjoy it.